Ofsted Inspection Report – We are an OUTSTANDING school. Our school was last inspected in June 2007. Please feel free to download the full report below. This is an outstanding school. By the time pupils leave at the end of Year 6, they are mature and confident individuals who have reached high standards in their work. Pupils’ personal development, well-being and their spiritual, moral, social and cultural development are outstanding. Based on mutual respect and trust, relationships between pupils and staff throughout the school are excellent. Pupils are exceptionally well involved in the work of the school and make especially good progress in acquiring the skills that will help them in their future life. Pupils thoroughly enjoy school and this is reflected in their very good attendance. Pupils feel very safe and understand how to keep healthy. Throughout the school, they show a love of learning and their behaviour is excellent. 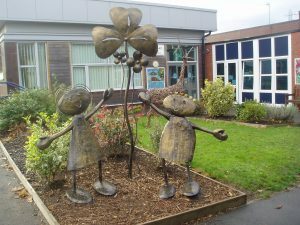 The sentiments of many parents are expressed by one who wrote, ‘Clover Hill is exactly what you would hope for when your child is at school, encouraging, supportive, educational, safe and happy’. The care, guidance and support that pupils receive are also outstanding. Procedures for keeping pupils safe are fully in place and the school works exceptionally well with other agencies to promote pupils’ welfare. Pupils are given excellent guidance on what they need to do to improve. Consequently, they speak knowledgeably about their targets; they are eager to reach the most challenging ones and have a good understanding of what they need to do to get there. The headteacher provides excellent leadership and strikes the right balance between striving for academic achievement and promoting pupils’ personal development and well-being. She gives a very clear direction for the work of the school, harnessing the talents of staff and building an excellent climate of teamwork. The school has an accurate view of its effectiveness; it is aware of its strengths and is quick to identify and act where things could be further improved. As a result, good progress has been made since the previous inspection and there is an excellent capacity to improve further.